I couldn’t believe a cookbook could keep me so engrossed I couldn’t put it down! Because I hate to cook! 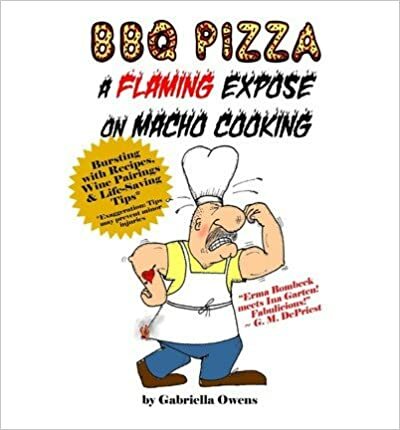 But by the time I finished reading, loving, and laughing my way through “BBQ Pizza: A Flaming Expose on Macho Cooking” — a book full of humor, impressive information, pizza recipes galore, and more — Gabriella Owens had made a believer out of me! I was seriously considering becoming a “barbecued-pizza specialist” and party host myself. But I figured the least I could do, after reading her exceptional expose –even learning what pizza peels are for– was to stop three pizzas short of a pizza peel to write this sizzling review. Gifted Author Gabriella is not only an expert on gourmet barbecue pizza parties, fine wines, wineries, and more, but a comedian — and the President of the California Writer’s Club, San Fernando Valley Branch. Her creative pizzas put the California Pizza House to shame! But they might be interested in some of her “fabulicious-Pizzalicious” dishes and recipes. While reading “BBQ Pizza,” I was kept so thoroughly entertained– laughing so hard all the way–I learned how to appreciate and appraise wines, put together perfect pizza parties, and much more — all with no pain! If you’re a standup comedian or would like to be, there are some great lines in this creative author’s book that could keep your audience in uproarious laughter indefinitely. Of Macho Cooking” or put it on your reading list today. You’ll have a fabu–lucious day!